North Carolina State University researchers have succeeded in proving that the crystalline structure of a material can be formed by disorder at an atomic level and not chemical bonds, by creating the world’s first entropy-stabilized alloy incorporating oxides. Schematic illustration of an entropy stabilized oxide at the atomic scale. “High entropy materials research has been a hot field since 2007, but no one reported that the unique structure of these materials was indeed stabilized by configurational disorder alone — and no one had created an entropy-stabilized material using anything other than metals,” says Jon-Paul Maria, a professor of material science and engineering at NC State and corresponding author of a paper on the new findings. High entropy alloys are materials consisting of four or more distinct elements in roughly equal amounts, but distributed randomly at an atomic scale. Their remarkable properties have made them a hot topic in recent years, and only a small hurdle stood between them and fame — they didn’t naturally exist. So, presumably with a cry of “For Science!” researchers went about to make themselves some. First let’s take a look at exactly how atoms arrange themselves in a crystal. A crystalline structure is not random, but consists of a repeating arrangement of atoms, unique from material to material, called it’s “lattice type.” In conventional materials, the arrangement of atoms is regular and ordered, with imperfections causing structural incompatibility that can lead to the structure breaking down around it. That’s why mine flowers grow in regular, geometric shapes — they are made up of regular, geometric arrangements of atoms. But in an entropy-stabilized material, this no longer holds true. The relative arrangement of atoms is completely random. By adding more and more different atom types to a crystal, you can generate more and more disorder if the arrangement of atoms on that lattice remains random. Finding the right mix of atoms that will retain this randomly mixed state is the key to entropy stabilization and testing the entropy question. 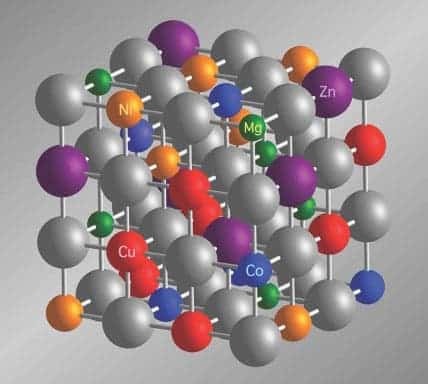 NCSU’s researchers forged their entropy-stabilized material out of five different oxides: magnesium oxide, cobalt oxide, nickel oxide, copper oxide and zinc oxide. These were mixed in powder form, pressed into a pellet, and kept at 1000 degrees Celsius for a few days to let them mingle. Then they took it and used the Advanced Photon Source at Argonne National Laboratory and X-ray fluorescence spectroscopy to determine that the constituent atoms in the entropy-stabilized oxide were evenly distributed and that their placement in the crystalline lattice structure was random. “The spectroscopy told us that each unit cell in the entropy-stabilized oxide’s structure had the appropriate distribution of atoms, but that where each atom was located in a unit cell was random,” Maria says. “Making this determination is very difficult, and requires the most sophisticated characterization tools available at the Advanced Photon Source. “This is fascinating — we’ve proved that you can create entirely new crystalline phases of matter — but it’s fundamental research,” Maria says. “A lot of additional work needs to be done to characterize the properties of these materials and what the potential applications may be.